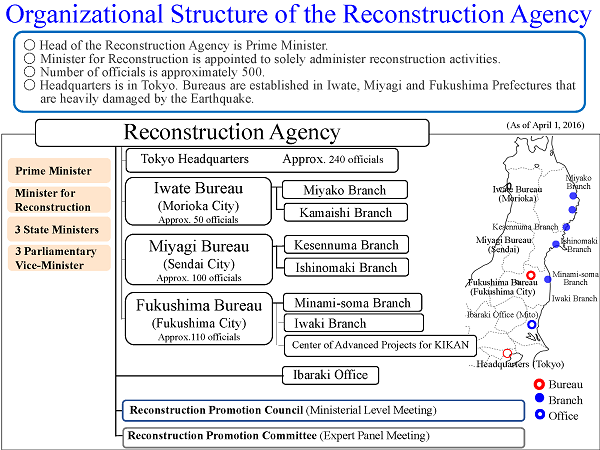 The Reconstruction Agency is the principal agency of the Government of Japan tasked with the reconstruction process following the March 11, 2011 Great East Japan Earthquake, which precipitated the triple disaster of earthquake, tsunami and nuclear accident. The Agency‘s main role is to accelerate structural reconstruction and revitalization in the affected areas, by supporting implementation of government policies and managing coordination of reconstruction strategy and initiatives between various branches of government at a national level and with local municipalities. Headed by a Minister, the agency acts as the ’Control Tower‘ for all reconstruction efforts, including coordination of reconstruction activities and cooperation with local governments. The agency was established within the Cabinet to centrally administer reconstruction activities, and expected to exist for no more than 10 years. The government‘s aim is to restore Tohoku’s position as a place for innovation, and for reconstruction of the affected areas to spur revitalization of the broader Japanese economy. Emergency Disaster Response Headquarters were established in the Government. “Basic Guidelines for Reconstruction” were issued. -A total budget for the Intensive Reconstruction Period was set. -Special zones for reconstruction were set to implement special measures for reconstruction. -A new budget system was created for reconstruction. The Reconstruction Agency was established.